The tribe Dirini is endemic to southern Africa. Larvae feed on grasses. The tribe was characterized by Miller (1968) as exhibiting a forewing cell shorter than half the length of the forewing, although his circumscription did not include Aeropetes or Paralethe, both formerly placed in Lethini (Miller, 1968) or Elymniini (Ackery et al. 1995), but now considered to belong to the tribe (Peña et al. 2006; Price et al. 2011). Price et al. indicate that the presence of a scaphium on the male genitalia is the sole known morphological synapomorphy uniting the group (the short forewing cell unites Dira, Dingana Serradinga, Torynesis and Tarsocera. Hypothesis of relationships based on the analysis of morphology and molecules by Price et al. (2011). Miller, L.D. (1968) The higher classification, phylogeny and zoogeography of the Satyridae (Lepidoptera). Mem. Amer. Entomol. Soc. 24, 1-174. Peña, C., Wahlberg, N., Weingartner, E., Kodandaramaiah, U., Nylin, S., Freitas, A.V.L. & Brower, A.V.Z. (2006) Higher level phylogeny of Satyrinae butterflies (Lepidoptera: Nymphalidae) based on DNA sequence data. Mol. Phylogenet. Evol. 40, 29-49. Price, B.W., Villet, M.H., Walton, S.M. & Barker, N.P. 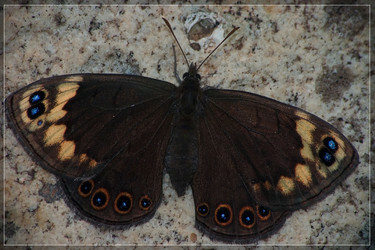 (2011) Using molecules and morphology to infer the phylogenetic relationships and evolutionary history of the Dirini (Nymphalidae: Satyrinae), a tribe of butterflies endemic to southern Africa. Systematic Entomology 36, 300-316. Page: Tree of Life Dirini Verity 1953. Authored by Niklas Wahlberg and Andrew V. Z. Brower. The TEXT of this page is licensed under the Creative Commons Attribution License - Version 3.0. Note that images and other media featured on this page are each governed by their own license, and they may or may not be available for reuse. Click on an image or a media link to access the media data window, which provides the relevant licensing information. For the general terms and conditions of ToL material reuse and redistribution, please see the Tree of Life Copyright Policies.